A group of Latin American activists decided to defy Russian anti-gay laws with a little help from their soccer jerseys. The six activists wore their shirts in ROYGBIV order to display solidarity because waving a rainbow flag — the longtime symbol of LGBTQ pride — is against the law in Russia. 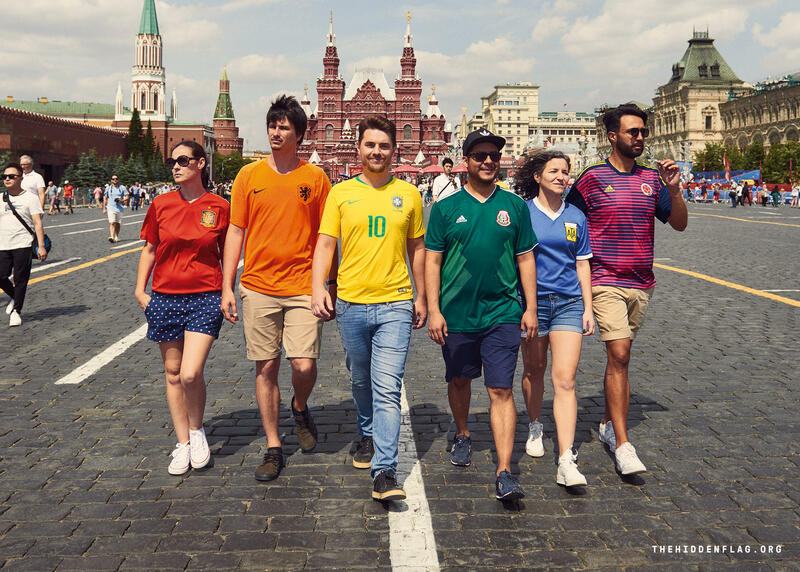 The defiant "Hidden Flag" — the brainchild of LOLA Mullenlowe, a Spanish digital agency, and FELGTB, Spain's largest LGBTQ organization — is the latest effort to call out rampant homophobia in Russia, especially as the country hosts the World Cup. "When Gilbert Baker designed the rainbow flag in 1978, he did so to create a symbol and an icon for the LGTB community," the group wrote on its website about the project. "Unfortunately, 40 years later, there are still countries in which homosexuality is persecuted, sometimes even by jail sentences, and in which the rainbow flag is forbidden." The group donned jerseys from Spain (red), the Netherlands (orange), Brazil (yellow), Mexico (green), Argentina (blue) and Colombia (purple) and visited iconic Russian sites — even posing next to some unsuspecting Russian police officers. "For me, Russia is a symbol of homophobia, with a government that allows discriminators to be protected by the law, and somewhere where people aren't free to love," Vanesa Paola Ferrario, who wore the Argentine jersey, wrote on the group's page. "I was interested in this project because it allows us to use our voices for those that cannot." The response to the project has been largely positive, according to LOLA Executive Creative Director Pancho Cassis. "It's getting huge and that's great news. Love is beating hate and spreading all around," he said. The movement has gone viral on social media, with many sharing their support for the project with the hashtag #HiddenFlag. Even Chelsea Clinton weighed in on Twitter, calling the project "courageous & beautiful." "Being visible is always a risk, but doing it with thousands of fans and fans of the World Cup and the press in front, is what motivated us to carry out the original protest," Cassis said in a statement. "The #HiddenFlag gives visibility to all the people who live in Russia and face discrimination and fear on a daily basis."